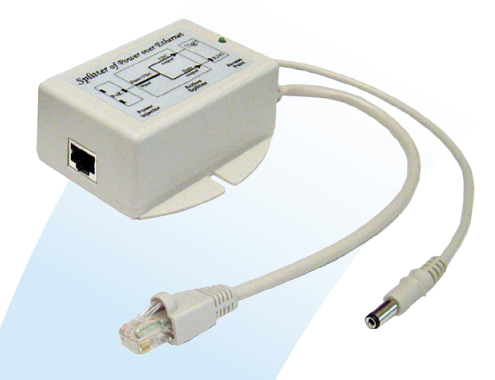 The active Power-Over-Ethernet (POE) splitter from Laird gives "carrier class" performance in a low cost system. With its IEEE 802.3af compatibility and advanced auto-sensing algorithm, it will accept POE power from any IEEE 802.3af router or power supply. The overload and short circuit protection will shut down power immediately when a short circuit is detected without any damage to the POE system. Power (36 to 60 V) is expected on ethernet pins 4/5 (V+) and 7/8 (V-) as per the IEEE 802.3af standard or pins 1,2,3,6 (Cisco Standard).
? The power supply can be centrally located where it can be attached to an uninterruptible power supply.
? Power can be supplied over long distances, up to 300 feet.
? Power can be available wherever network access is available.
? The user has the ability to easily power-on reset the attached equipment from a remote location. The active POE splitter from Laird can be used by the original equipment manufacturer to supply power to remote equipment and devices without the expense of building in separate POE functionality into their equipment. These devices are a good fir for the industrial market for sensing and remote video applications.